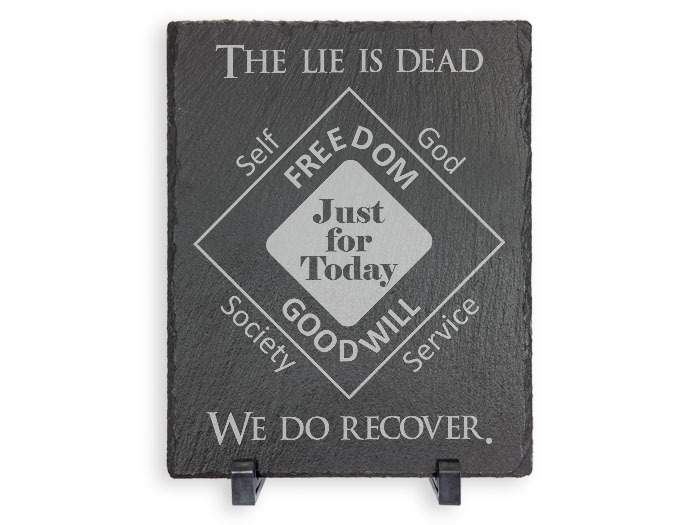 A beautiful laser engraved, natural slate plaque expertly displaying our "Just for Today" slogan along with "The Lie Is Dead - We Do Recover." Perfect for the rooms, club-house, office, or home! 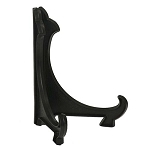 Suitable for hanging in any room, office, or meeting hall! Each plaque has 4 foam protective dots on the back (furniture safe) and is delivered with a pair of plastic legs, You can also display your slate plaque on a table, desk, shelf or mantel with one of our Plaque Display Easels. Please note: The laser engraving results in sharp, light-gray graphics and text which contrasts beautifully against the dark gray natural stone plaque. Text and graphic contrast are subject to the natural characteristics of each individual piece of slate. Yours will be a one-of-a-kind, unlike anyone else's in the world! We do not utilize color fill techniques to increase the darkness/contrast of the engraving - opting instead to allow the beauty of each piece of stone to bring into being a special and unique piece of art for you to treasure for years and years. Have an idea for a special plaque? Prefer a different font? Custom work is our specialty! Please Contact Us with your requests.